The therapeutic benefits of nature are prompting hospitals to turn rooftops into on-site oases. In the 19th century and earlier, gardens and natural healing spaces were often part of hospitals and sanatoriums. As the science of medicine advanced, fewer hospitals made room for garden space. Now, a resurgence of interest in the therapeutic benefits of nature is prompting many hospitals to create relaxing and restorative environments for patients, visitors, and staff. Increasingly, these green areas are planted above ground level, on hospital roofs and terraces. Such gardens provide easily accessible and comforting escapes from the stress of being a patient, dealing with a family member’s illness, or working as a health care provider. Opened almost two decades ago, the eighth-floor garden at St. Louis Children’s Hospital has trees now more than 18 feet tall that provide shade as well as beauty. The 8,000-square-foot space is filled with flowers, shrubs, and pathways wide enough for wheelchairs. Young patients can touch, smell, and feel the plants. 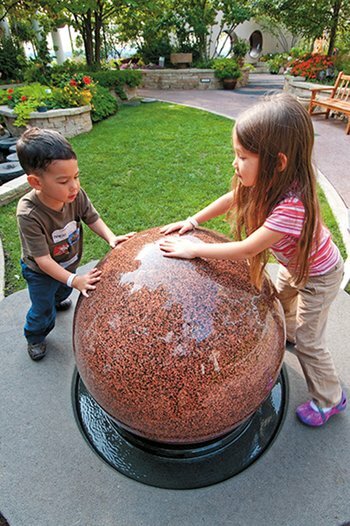 They also can safely push a 1500-pound granite ball that rolls in a large socket, powered by pressurized water. “It’s not a playground. It’s a place for healing, meditation, and decompression,” said Gary Wangler, HTR, the hospital’s horticulture therapist. Located off a patient floor, the garden is used for events such as visits from storytellers or a solar eclipse program. In horticultural therapy sessions, children dig plants, walk paths, and engage in other activities that reinforce physical and occupational therapy goals. “They’re having fun and not realizing they’re using their muscles,” Wangler said. Mindful of the need for a tranquil environment, planners at the John Theurer Cancer Center at Hackensack University Medical Center (UMC) in New Jersey incorporated plants and nature throughout its design for patients, visitors, and staff to enjoy. The 2,000-square-foot terrace garden provides a supportive setting and views of the Manhattan skyline. It features benches for socializing or resting, accessible walkways, and seasonal color, visible from every floor. Open from early morning to evening, the terrace garden features a range of ornamental plants as well as vegetables and herbs that patients can use in their meals. Oncology dietitians lead cooking classes, preparing produce from the garden in an on-site teaching kitchen, to help patients manage their appetites and nutrition. “Teaching patients to garden and cook is critical to empowering them during treatment and to show them how we’re invested in their future,” said Andre H. Goy, MD, chairman, executive director, and chief of the Lymphoma Division at John Theurer Cancer Center. 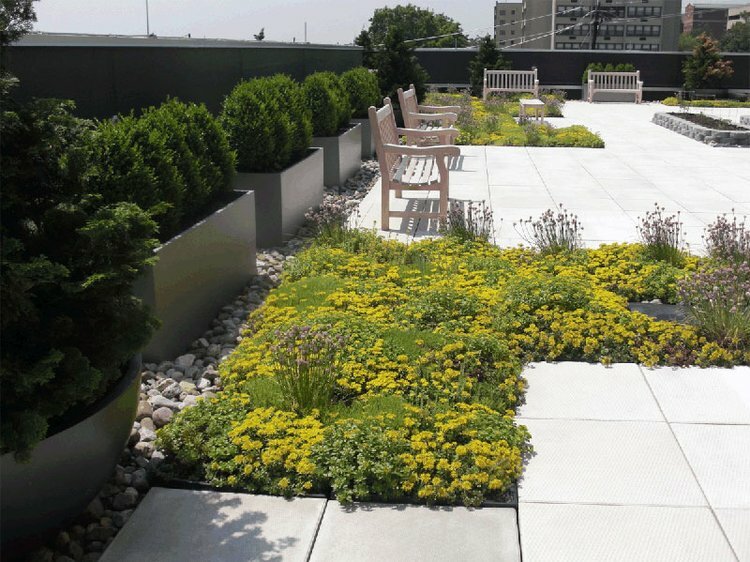 Hospital roof gardens may be as important to staff as they are to patients. The ninth-floor roof garden at Rush University Medical Center—open only to those who work at the hospital—reflects that understanding. 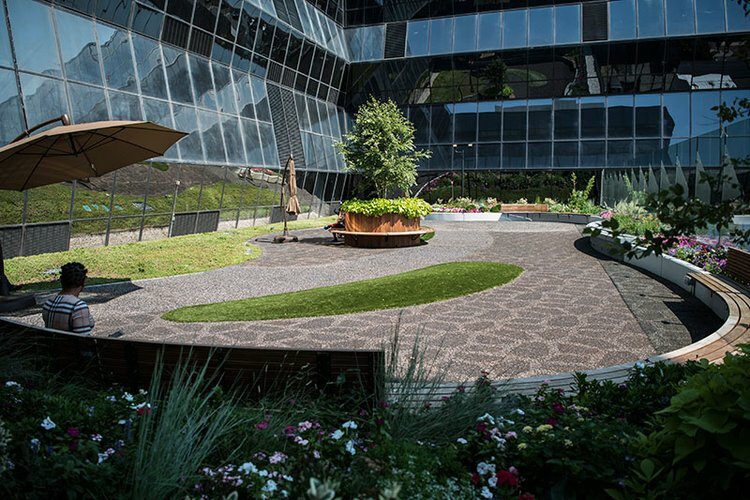 It helps employees de-stress with a circular walking path and benches for sitting. 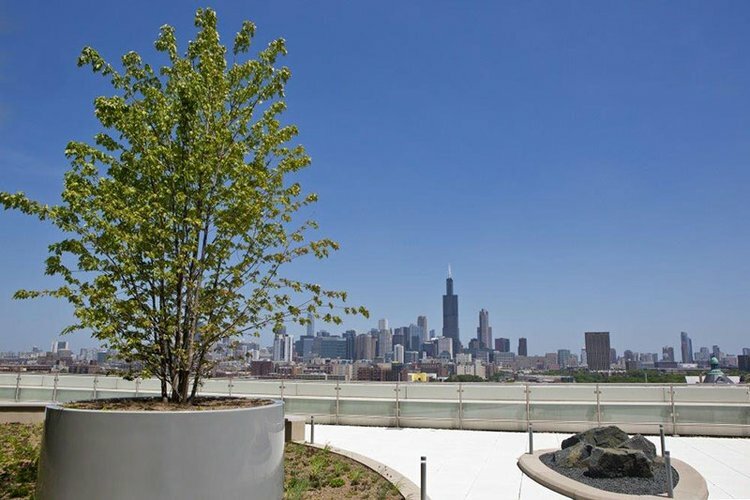 The garden also has “an amazing view of the downtown Chicago skyline,” said Raymond LaBrec, associate vice president of facilities management and capital projects. Although the rooftop garden is closed in winter, it opened briefly in February 2017 so a Rush Medical College student could propose to his girlfriend in its impressive setting. At the hospital’s entry pavilion, another roof garden gives patients and visitors a place to get away from hospital noise and stress. “This is a comforting, calming place where someone can go to relax, quietly reflect, or have a friendly conversation outside of a health care setting,” LaBrec said. The roof gardens are designed with native plants in containers that capture rainwater. Moving the child wasn’t easy since she had complicated care equipment, but a staff team managed. She was able to be outdoors and listen to her favorite music with her family. That gave rise to planning an outside garden. Now, what once was a large gravel rooftop has become a therapeutic natural space for patients and families. The garden has trees, plants, a small fountain, and labyrinth. Its doors are wide enough for beds to roll through, with power outlets outside for patients who use machines. The roof garden also helps staff who are having a tough day. “We encourage them to take a step outside, walk the garden, and refresh, so it creates some resilience for them as well,” Gorman said. While hospital roof gardens are created primarily to meet people’s needs, green roofs are designed for environmental benefits and to lower energy use. “The practical purpose is to reduce heat load to the building and to reduce the amount of water runoff into the city’s storm water system,” said Raymond LaBrec, a facilities manager at Rush University Medical Center, where green roofs are a feature. Green roofs use soil and drought-resistant plants such as mosses and sedum to create natural insulation. Most green roofs are not open for public use, although they sometimes can be seen from inside a building. Boston Medical Center (BMC) took the green roof idea further and now has a 7,000-square-foot rooftop farm that grows fresh vegetables for use in patients’ meals and BMC cafeterias. The hospital donates some of the produce to local food pantries. Its farm is also designed to cut energy use and absorb rainwater. For media inquiries, visit the Newsroom.